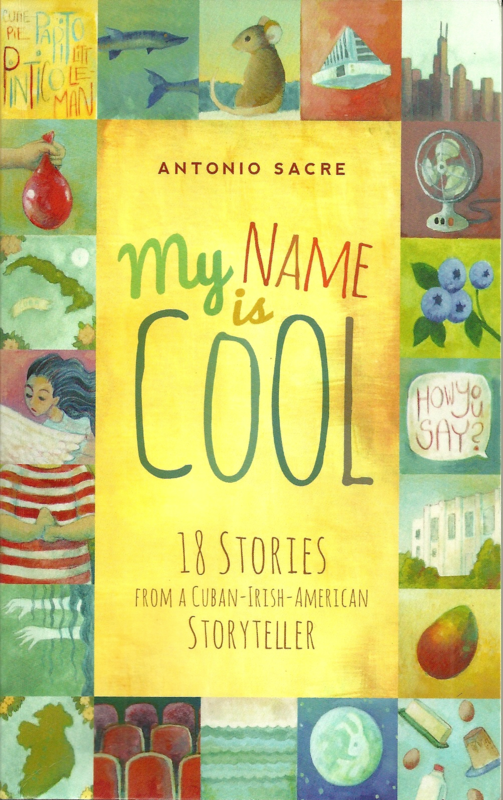 Cuban-Irish-American Storyteller and Author, Antonio Sacre, shared with us his new book, My Name is Cool, which colorfully describes what many bicultural Latinos experience growing up in the U.S.
From topics on Abuelitas, to Spanish nicknames and dichos, each story is engrained with insights that draw from being raised in multiple worlds and interpretations of self-identity. 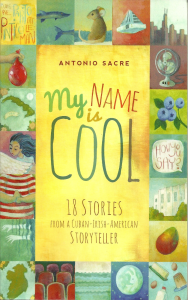 After enjoying this great read we took the opportunity to pick Antonio’s brain on how he sees the Bicultural Identity evolving and where his writing and storytelling are taking him. Check it out! – What inspired you to particularly bring these 18 stories together in this book? AS: I’ve been telling stories for nearly 20 years, but my first book, The Barking Mouse (Albert Whitman & Company, 2003) was published over 10 years ago after 175 rejections. I am the most rejected author I have ever met! After seeing my name in print for the first time, I set out to get a second book published. Only 8 years and 75 rejections later, La Noche Buena, A Christmas Story (Abrams Books for Young Readers, 2011) was published. While I’m getting rejected as an author, I tell stories in front of thousands of people each year nationwide. Last summer, while telling most of my favorites from my ever-expanding repertoire of stories at the Timpanogos Storytelling Festival in Utah, I noticed a man following me around all weekend. Finally, he approached me after my last set and asked me if I’d be interested in collecting the stories he had heard me telling at the festival into a book. He gave me his card, I saw that he was a publisher with a small but lovely publishing house, and I said yes. My fourth book, My Name is Cool, was not rejected once! I’ve always wanted a book like this, one that collected many of my favorite stories that I perform for all ages, but wasn’t sure how to go about getting it published. In many ways, it was preparation (I had been performing some of those stories for years) meeting opportunity (being featured at a major storytelling festival) and vision (a publisher seeing the possibility) that was the inspiration for this book. – You mention in your book how you felt in between cultures growing up, how do you think your experience has affected your writing or storytelling and do you think your core audience is a bicultural America? AS: When I first started storytelling nearly 20 years ago, I was living in Chicago, a place that at the time had nearly a million people from Mexico and Puerto Rico, and nearly a million more from Spanish speaking countries all over the world. My first paying jobs as a storyteller came specifically from my ability to perform in Spanish and English. Being bilingual and bicultural affects every single aspect of my writing and performing. It has given me a great empathy for the many, many families I meet from other countries where they don’t speak Spanish or English, a desire to learn stories from these cultures, and a need to share with these families the challenges, benefits and joy of holding both cultures simultaneously. When I started, there were very few other bilingual storytellers on the national circuit, and so I was called upon to serve three markets at the same time: the English speakers who were eager to hear and learn about Spanish-speaking people and the places they come from; the most recent immigrants who have very little English; and the bilingual children of these immigrants trying to forge their way. While I am most comfortable with an audience who understands the difference between pozole and menudo, or ropa vieja and picadillo, or a dicho and a chiste, I also am honored to be able to introduce people to our bicultural and bilingual experience as well. 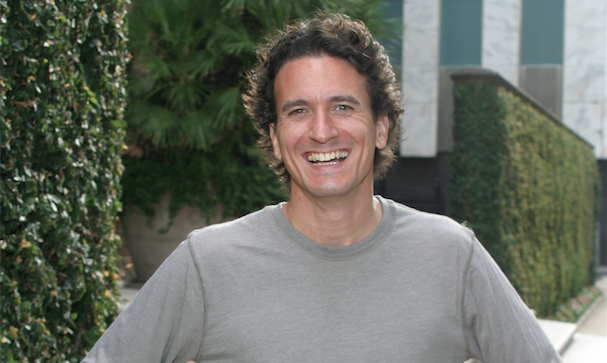 – I enjoyed how you incorporated “Dichos” into your storytelling, what is your all time favorite Dicho? AS: Nearly every time I speak with my dad on the phone, he says, “Como dijo tu abuela…” and he will repeat one of dozens of dichos my grandmother taught him when he was a boy. But if I asked him to tell me all of the dichos he knows, he could only name a few. They only seem to surface in context. But I’ve been writing them down as soon after my talks with him as I can, and the list of proverbs he’s told me over the past few years is over 100. I put my 10 favorite dichos in my third picture book, A Mango in the Hand, a Story Told Through Proverbs (Abrams Books for Young Readers, 2012) only rejected 15 times. Of all the dichos in that book, my favorite one is “No hay mal que por bien no venga.” Every time I get a rejection from a publisher, I think of that dicho. I end up thinking of it a lot! – Do you think retro acculturation is increasing among Latinos and do you feel this is what you experienced when you had to relearn Spanish? AS: First of all, I had to google “retro acculturation” to find out what it meant! But even after reading up on it, I can’t really say that’s what I experienced as I relearned Spanish. The driving force behind why I wanted to speak Spanish again came from two places in my heart: jealousy of my brother and love of my grandmother. When my brother speaks Spanish, our neighbors on the street in little Havana (where my abuela lived and I visited many times) would say to him, “¿De dónde tu eres en Cuba, ‘chacho?” When they heard me speak Spanish, they’d often say, “Oye, hablas Español muy bien, ¿dónde lo aprendiste?” But also, I realized that my grandmother was too old to learn English. As I got older and realized how much she meant to me, I wanted to be able to have real conversations with her in her language. My circle of friends include many people from Mexico, Cuba, Puerto Rico, and Guatemala. Many of them have children who were sometimes born in those countries, but more often were born here. It seems that among my close friends and family, we gravitate to the things that matter most to the people we cherish. I know it brings my father great joy when I share a new song from an artist recording in Spanish from one of those countries, so I seek out that new music, both because it’s pleasing to listen to, but also because I know how much it will mean when I share it with him. Also, I love cooking Cuban black beans for him, because even while they often come out very tasty, it reminds him of my grandmother, and he can tell me how I can’t ever match up to how she made them. But, each Cuban meal I cook keeps her memory alive, and that’s part of what I want to do as a storyteller and an author. – Becoming a bilingual storyteller set you off in a new direction in your career – how do you think Spanglish or being bilingual is helping Latinos in their careers or why is this so important? AS: I have many examples of friends and family who, in tough job markets, were able to hold onto their job or find new jobs because of their ability to speak Spanish and other languages. These people are able to serve more customers, help more people, be more valuable for their employers, and make more money for everybody because of their knowledge of other languages and cultures. My children are bilingual, and I hope when they get older, they will choose to learn a third language. – It was hard for your Dad to come to terms with your profession. What advice do you have for readers when they are pursuing unconventional careers? AS: When I was in college and was thinking about a career in the performing arts, I spoke with my acting professor and told him I wanted to make a career of acting and performing. He told me to go home and think if there was anything else in the whole world I could do, because I wasn’t good enough to make it in the arts. I was furious with him, but I did what he suggested, and I went home and thought through all my options. The next day, I went back to him and told him there was nothing else I could do. He told me I needed passion, knowledge, practice, and experience. I had the passion, and I set out to find the knowledge. I’m still learning. I pay to take classes all the time, in writing and in making a living in the arts. I reinvest in my career by paying experts to guide me in areas that need attention while I pursue my passion of writing and performing. I practiced my craft for free for years (and still do) and it wasn’t long until I had enough experience to begin to charge money for what I do. I believe that even if people close to you don’t understand what you are doing, if you have passion and commitment for it, and are thrilled and challenged and authentic in your pursuit of it, they will at the very least respect you for it. Lastly, if an artist is having trouble getting paid for what they do, I ask them, what is the story that only you can tell, and who is the exact audience that needs to hear it? It’s a big world; tell that story the best way you know how, and then look for the audience that really needs to hear that story. – Larry Sergeant was one of my favorite stories. With social media taking over, how do you feel that sharing your stories or storytelling will expand there and save the world? AS: The size and scope of social media is staggering. The biggest audience I have ever performed in front of live was 10,000 people. I usually perform for about 500 people at a time, and I usually perform about 100 days a year. So, in a typical year, about 50,000 people hear my stories. In my 20 years of performing, in 45 states and 8 different countries, I’ve reached over one million people with my stories, and I am incredibly grateful and lucky to be able to do what I do. That’s incredible. A worldwide conversation was started, and all over the world, children are thinking how they might be able to stand up for each other, like those 5th graders stood up for little Danny. Maybe all the ways stories can be told on social media can save the world. I firmly believe that something magical happens when a group of people gather together and hear stories live. This is how language started, thousands of years ago. Community is formed, wonder is created, and people are moved and educated in ways that are surprising. While I have watched hundreds of videos on social media, very few of them stand out as much as the performances I have seen live. Children and families need to experience the performing arts together. However, I also know the power of social media, and in the past year, have dedicated a lot of my time on twitter (@antoniosacre) and Facebook, as well as putting videos out on my website, antoniosacre.com. I hope to be able to continue to reach many people live, and even more people on social media. – Who do you recommend your book to? AS: Familius, the publisher of My Name is Cool, specifically publishes books to support families, in all their shapes and sizes. The primary audience is families who want to explore and enjoy stories from different cultures, and more specifically families who may be raising bicultural and bilingual children. But the book is for anyone who loves reading funny and hopefully inspiring stories. I recommend parents read some of the stories in the first half of the book out loud to children up to 8-years-old, and I hope that children older than that will read it for themselves. I also hope that people of my father and grandmother’s generations will use the book as a jumping off point to remember and share their own stories with their families. – Will we see another book with more short stories? AS: I’m constantly working on more stories, and I would love to collect them in a second volume. I have no immediate plans to publish a follow up collection of short stories, but it’s on my list for 2015. In the meantime, I have completed a new picture book this year that my agent and I think has great possibility, and it’s only been rejected six times! My goal in 2014 is to get it rejected as many times as possible. I have also completed my first fiction novel that my agent is soon going to pitch. She sees it as a humorous book where David Sedaris meets Sandra Cisneros, and is very excited as she takes it to market this month. Hopefully by next Christmas, I can share with Mercury Mambo that I collected a bunch of rejections for that book, too!